1. Our single drum vibratory roller is equipped with high powerful D6114 or water cooled turbocharged diesel engine, and large capacity fuel tank. This makes the compactor suitable for working at a high altitude. 2. It can be fitted with special heavy duty gearbox or synchronous gearbox. The driving axle is provided with high braking torque. 3. This road roller is provided with dual-amplitude vibrating device and drum travel supporting structure. 4. Our single drum vibratory roller is stylish in appearance. Its driving cab is mainly constructed of T type angular glass. 5. Linked operation mode is adopted between the clutch pedal and the engine throttle. 6. This paving equipment is fitted with adjustable instrument table with liquid crystal instrument panel. 7. Its travel speed is 10.5km/h. The turning radius is 7500mm and the drum width is 2130mm. The drum width and drum diameter of these single drum vibratory rollers are 2130mm and 1500mm separately. The wheelbase is 3080mm. Our LSS214, LSS212 heavy duty vibratory rollers are applicable to the compacting operations in construction of high-class highways, railways, airports, harbors, dams, and large-scale industrials, etc. These road rollers can compact many kinds of non-cohesive materials such as gravel, crushed stone, sand-macadam mixture, sandy soil and rock filling, etc. 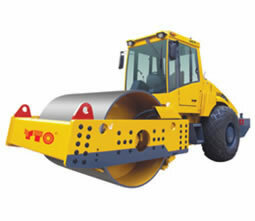 YZ7G single drum vibratory roller adopts mechanical travel drive, hydraulic vibration and smooth rubber tire. It can be used to compact various stabilized soils and bituminous concrete, etc., on road surface construction. This compaction equipment is extensively used in the construction of highway, municipal road, and	industrial ground, just to name a few. We are an ISO9001:2008 certified single drum vibratory roller manufacturer in China. In addition to single drum compactor, we also offer combine harvester, wheel loader, motor grader, etc. With subsidiary offices in Asia, Africa, Europe and America, we can provide you high quality agricultural machinery and construction machinery conveniently. Corn Harvester Our combine harvester is available in several models to suit different requirements. As its cab protrudes forward, our corn combine provides high visibility.